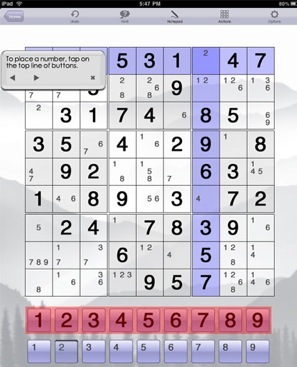 Games development company Astraware has this week unveiled its new Sudoku app on the Mac App Store. With a good track record in mobile application development, Astraware is perhaps best known for its iteration of the popular Bejewelled game for mobile. The “so what” factor here then is that Astraware Sudoku started out life on the mobile device — and it has now grown up to the desktop. … and this is (generally) quite the reverse of the way apps normally migrate. Desktop to mobile usually means – reduced processing power available, reduced screen size, limited battery life, restricted input methods (i.e. no full keyboard), no extended graphics or sound cards etc. “In terms of the development effort, the shared technologies between iOS and Mac OS (Cocoa, OpenGL plus Linux libraries such as zlib and cURL) made the conversion relatively painless. The main uncertainties came from being early to a new Apple App Store, with the unknown review process that that entails. In the end, three of our four launch titles came through unscathed — with the fourth requiring a just couple of tweaks to get through,” added Oakley. Astraware Sudoku includes all the features avid Sudoku players require including a puzzle generator which creates billions of puzzles at multiple difficulty levels; an intelligent hint system; manual or automatic pencilmarks; a Sudoku solver; and Enter Your Own which allows you to enter puzzles from newspapers and magazines and use the assistance tools to help solve them. Astraware Sudoku also includes the unique Puzzle of the Day daily challenge, where players can download each day’s featured puzzle at their chosen difficulty level and once completed submit their time to see how they compare with other players worldwide. Astraware Sudoku is available on the Mac App Store, priced at $1.99.